(CNN) – The chairman of the Republican National Committee unveiled his latest attack on President Barack Obama on Sunday, comparing him to the captain of the wrecked Costa Concordia cruise ship. 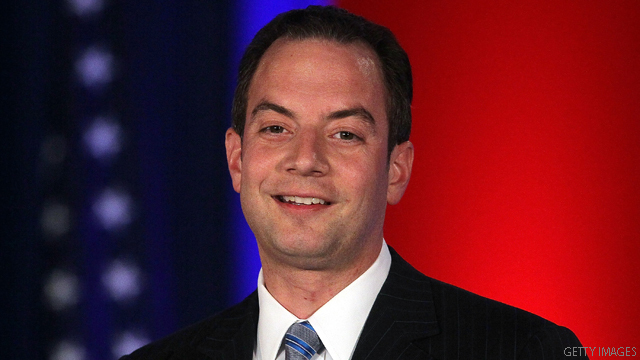 When asked if the infighting in the GOP presidential primary race would harm the eventual nominee's chances against Obama in November, Reince Priebus said the party would unite by then in an effort to win the White House. "In a few months, this is all going to be ancient history and we're going to talk about our own little Captain Schettino, which is President Obama who's abandoning the ship here in the United States and is more interested in campaigning than doing his job as president," Priebus said on CBS' "Face the Nation." Priebus added the president is "fleeing the American people," just like Schettino allegedly fled his cruise liner. The ship rolled onto its side in shallow waters off an island on Italy's Tuscan coast on January 13. Seventeen people are confirmed dead and 15 people remain missing while Francesco Schettino is under house arrest and faces possible criminal charges of manslaughter, shipwreck and abandoning ship. Following the jab, CBS host Bob Schieffer seemed caught off guard by Priebus' comment, asking with a laugh: "What did you just say? What did you call President Obama?" Priebus was defiant in his response. "I called him Captain Schettino, you know the captain that fled the ship in Italy," Priebus said. "That's our own president who's fleeing the American people and not doing his job and running around the country and campaigning." LOL. The GOP is highly delusional, methinks. Wow! If I was a republican, I would avoid metaphors around 'running ships onto the rocks'. You know what's worse??? CNN comparing President Obama in full headline font to that horrid Nigerian Goodluck Jonathan. SHAME on YOU CNN. I expect it from the RNC, but not from what I thought was an actual news organization. Is it true that the GOP have a higher rate of Alzheimer's ? Correct me if I'm wrong , wasn't it Caption Bush who ran the USS America on to a reef ? And here I thought it was Captain George W. Bush who ran the ship aground and then initiated the bailout! I guess GOP revisionism survived the crash...too bad! Even when he explains it, the snarky attempted insult doesn't make any sense. What a master comedian – one who has to explain his own jokes. Talk about a stretch. And it's not even funny. Typical of GOP attempts at humor. Next time, make a quip about the death penalty. Or people who are without health insurance. Those are already proven to get big laughs from Republican voters. Of course this proves yet again that all the Republicans can offer is grade-school insults. Wow, how's that for name calling from a guy who shouldn't be throwing stones. Thanks Penice Pubice for your dreadful insight and using a tragic life claiming incident so flippantly. Say goodbye to your job.